The act of painting has been a life long passion of mine. Creating is an adventure that allows me to get lost in my own world and in that moment nothing else matters. The family history of visual artists and musicians has provided me with the natural genes. I always felt a certain affinity to the French Impressionism and I have studied them on my own. I am a self-taught artist and I refine my skills by watching, studying, absorbing, understanding and participating with other artists. If “Art is the Minds Impression” then my work is to reflect that notion. My goal is to connect with the viewers and to leave in this world an impression of me as small as it may be. 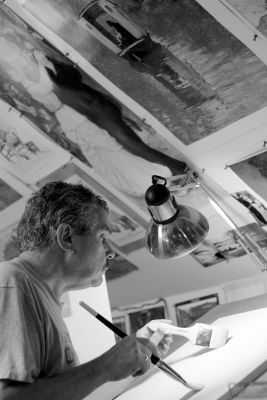 A current resident of Wakefield, Massachusetts, Robert Crooker comes from a family with a long heritage in the arts. He however, considers himself a self-taught artist. Robert’s work is an extension of his vision, detailed, meticulous and yet reflecting his passions and emotions of the every day life. Fort Point Arts Community Studio Members Group Show. Fort Point Arts Community Holiday Show. Red Platform Exhibition, Midway Studios, South Boston. Lakeside gallery at Rolling Ridge Convention Center, North Andover, MA. Art in the Park sponsored by the Andovers Artists Guild, Andover, MA. Primarily a life long self-taught artist. Attended Life Drawing classes at Montserrat College of Art, Beverly, MA. in 1976 and 1977. Currently a member of Tewksbury Community of Artists, Tewksbury, MA. Currently a member of The Reading Art Association, Reading, MA. Retired – Full Time Artists – Acrylic on Canvas.